Need to send a message to everyone that has an appointment tomorrow? No problem – reach them by text, phone and/or email easily using our bulk messaging features. 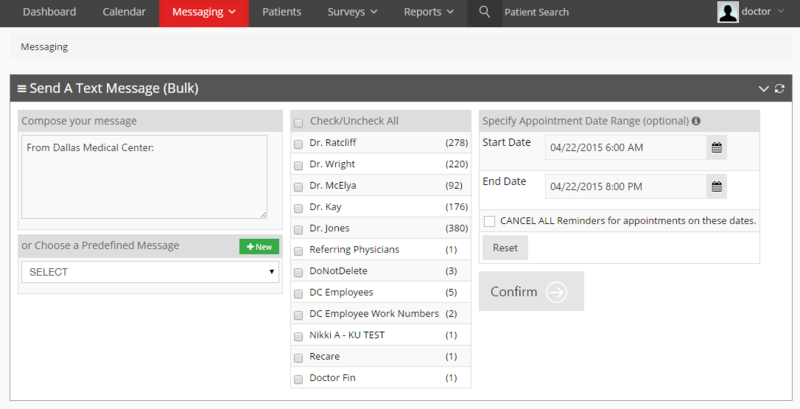 Specify your message, select the patient groups, and specify an appointment range. View and Call those patients that have not yet confirmed for a specific day. 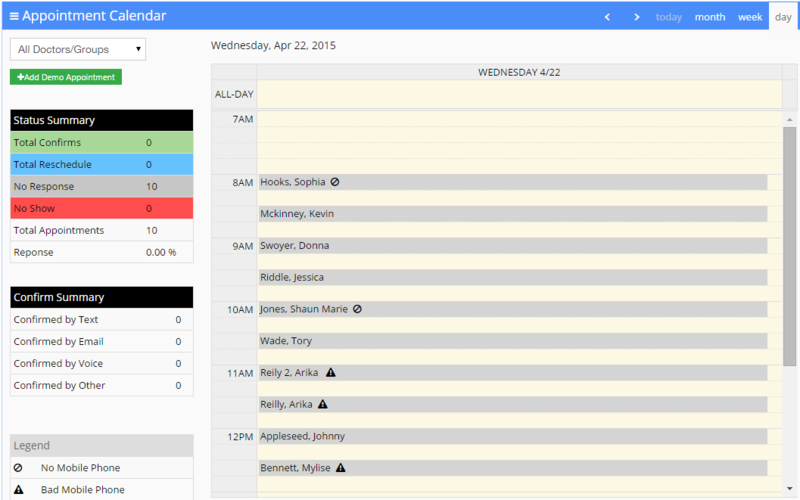 Quickly send a no-show message to those that missed their appointments on a specific day. View and respond to incoming messages from your patients. Our Patient Management Tool will make sure that your patients receive the types of communications they want. You can specify what types of reminders each patient would like to receive, and also which language – Reminders can be sent in both English and Spanish. 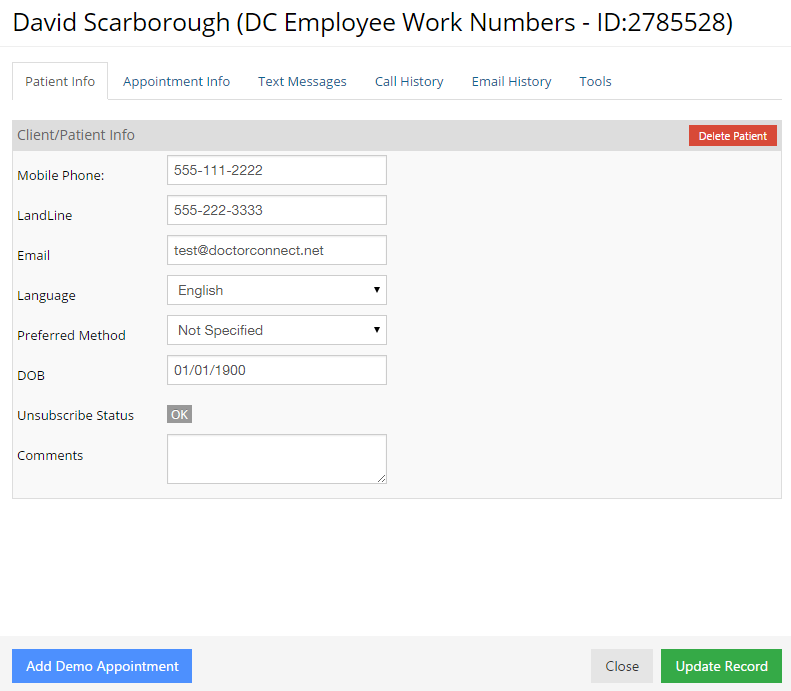 This screen also gives you a history of all the communication that has occurred between your office and the patient through doctorconnect – see past text messages, voice calls and emails. Whether you have 1 or 100 providers at your facility, our system imports all your appointments and reminds them at the intervals you require. For example, you can choose to set a reminder to go out 2 days before the appointment, then another 1 day before, and even a 3rd 1 hour before the appointment. All of our reminder methods ask the patient to either confirm the appointment, or to request a reschedule. At a glance, you’ll know who has been contacted, who has confirmed, and which patients require assistance. Because your patient population’s comfort with technology varies, we use all major communication systems available in an automated fashion. 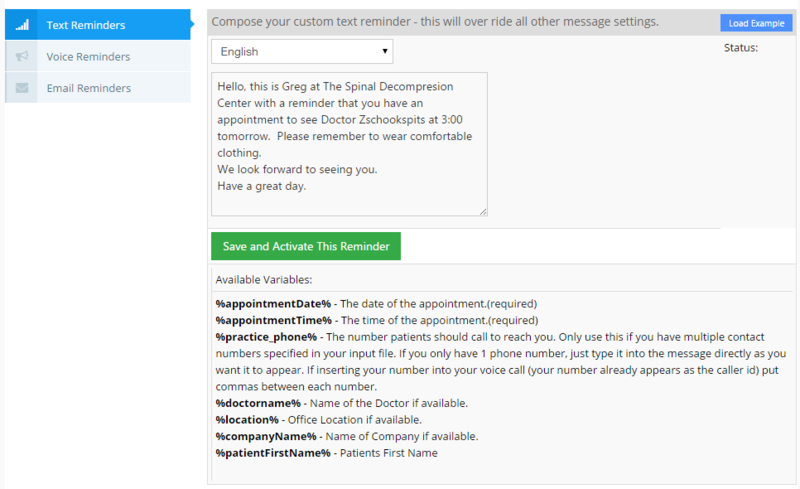 DoctorConnect allows you to drill down to set each patients reminder preference to text, phone, or email. You pick the format(s) and the scheduled reminders are delivered per your wishes. Those who have text messaging available prefer to use it over any other communication medium. All reminders are fully interactive which allows patients to confirm and request reschedules. Your staff can respond to inbound patient text messages from their PC.